A punch to the face. This seems to be all that separates taekwondo practice in South and North Korea. The South, following the rules of World Taekwondo -- on which most international competitions, including the Olympics, are based -- bans punches to the face, while the North allows them with gloves. 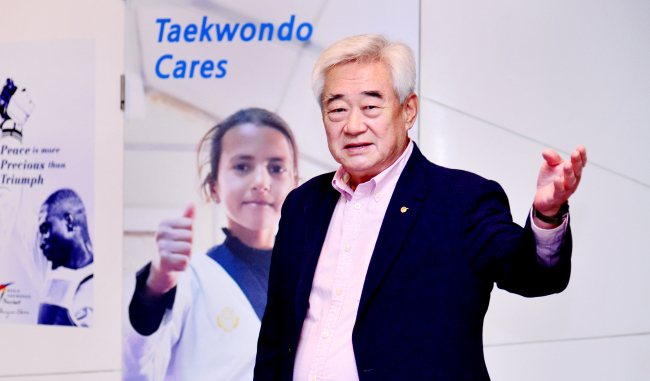 As the two Koreas seek to mend fences and expand exchanges in the cultural sector, World Taekwondo President Choue Chung-won says that improving ties in taekwondo can contribute to establishing peace between Seoul and Pyongyang. Choue, who has led World Taekwondo since 2004, had just visited North Korea on a five-day trip with his demonstration team on invitation from the ITF. The two organizations held a joint performance while there, on the sidelines of which he discussed further cooperation between the two taekwondo governing bodies with his ITF counterpart Ri Yong-son. The two leaders reached an agreement to create a joint body for the integration of the sport, in which each organization has different rules. They also agreed to work toward a joint performance in the future, including the upcoming 2020 Tokyo Olympics, joint training and a joint effort to have UNESCO inscribe it on the list of Intangible Cultural Heritage of Humanity. The martial art in the two countries has taken on different forms since 1973, with the launch of the WT. The differences range from terminology -- the form is called “poomsae” here while it is “teul” under the ITF rules practiced in the North -- protection gear on the head, chest and on the groin, and the duration of each match. In a landmark agreement in August 2014, the two organizations moved closer to each other by agreeing on the exchange of demonstration teams and other matters. In the following year, an ITF demonstration team performed at a WT-organized event for the first time at the 2015 WT World Championships in Chelyabinsk, Russia. Despite his organization being the only taekwondo governing body officially recognized by the International Olympic Committee, Choue said the WT believes in “One world, One Taekwondo” like the slogan it has been hoisting in the past few years. “It has been 45 years since we went our separate ways, so (integration) will not take place overnight. We need to better understand each other, and there are a lot of issues that need to be dressed at the working-level. It will take time to deal with them one at a time,” Choue said. He added that this includes WT-affiliated players participating in ITF-led tournaments and vice versa, and allowing the ITF-trained players to compete in the Olympics, given that they follow the current standards required to participate in the event. Among the keys to reducing the gap is the para taekwondo that was confirmed as a sport for the 2020 Tokyo Paralympic games, he noted. “This is not something that existed before the South and North Koreans practiced different forms of taekwondo, but a completely new era. A blue ocean, so to speak. And it’s something that we can do together anytime we want,” he said, explaining that it can be a stepping stone to narrowing the differences in the sport. It is the same way with freestyle poomsae, he said, which is the freestyle demonstration of high-level poomsae movements. Choue said he believes North Korean demonstration team’s performance last year at the WT Taekwondo Championships in Muju, South Korea contributed greatly to relieving inter-Korea tensions. The North Koreans again sent their team to PyeongChang for the Winter Olympics in February. Eased tensions between Seoul and Pyongyang have traditionally been accompanied by increased exchanges in cultural sectors. These included visits and performances by artists and more recently, a decision for a joint excavation and research of the Manwoldae palace site in Kaesong. Choue, whose visit to Pyongyang marked the first time he saw the city where his father, the founder of Kyung Hee University in Seoul, grew up, said he hopes for more joint events between the two bodies. “I don’t think there will be any major events until Tokyo (Olympics) because we just have too much on our plate right now. But we are very open to joint events.” he said. Soon after his Pyongyang visit, Choue visited Cambodia last week to present the WT’s development fund for taekwondo in the country. He also visited the Cambodian taekwondo authorities to expand cooperation and the taekwondo education in the country. “Next year marks the 25th year since the decision was made to make taekwondo an official Olympic sport. We plan to hold more events to promote taekwondo across the world,” he said. Initiating the Taekwondo Humanitarian Foundation to provide training and education for refugee children and teenagers, including the Syrian refugees in the Azraq refugee camp in Jordan, is one such method. The group also launched a Taekwondo Cares program to support orphans in foreign countries. “The kids who had help from these programs, their image of Korea is through taekwondo. This helps spread a positive image of Korea and spark interest in the county. With more activities between the Koreas and with foreign countries, Choue said a goal for taekwondo is to become more approachable, to become more spectator-friendly and media-friendly.